After spending over 30 years in executive positions in the Interior Design industry in Michigan and Georgia, it’s been very rewarding to feed my creative soul and return to my roots as an artist. 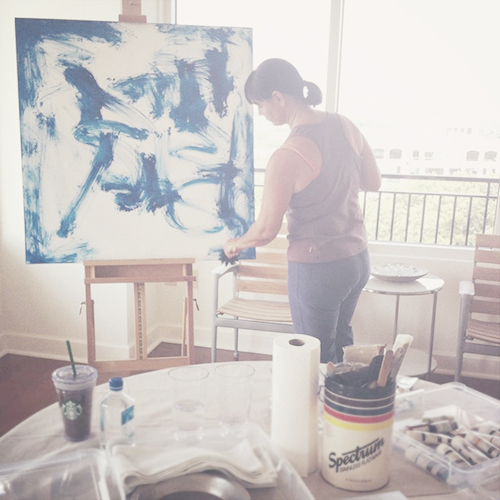 My primary work consists of large scale, abstract designs using acrylic paint on canvas. Inspiration comes from within me - how I’m feeling, what I’ve seen and where I’ve been. Some days playful, some days gutsy, the results of which are colorful, bold, layered and complex, or alternatively simple in their design and execution, whether I choose to pick up a paintbrush, or putty knife or simply my fingers. My first solo exhibition was held at Steve Mckenzie’s, a designer showroom and retail store in Atlanta’s West side shopping district, entitled “Awakenings” in Spring 2013, featured in Atlanta Homes and Lifestyles magazine in the April 2013 issue. "Some days playful, some days gutsy, the results of which are colorful, bold, layered and complex, or simple in their design and execution." Atlanta’s design community has enthusiastically embraced my work! In addition to “Awakenings”, my work has been featured by designer Michel Boyd of Smith-Boyd in his installation for Atlanta Homes and Lifestyle Magazine’s Christmas Showhouse 2012, designer Rick Anthony Bonner of Insidesign’s vignette for the American Craft Council Show 2013, and model room displays at the Atlanta Decorative Arts Center (ADAC) created by Atlanta designers Ann Wisniewski for Century Furniture, and John Fernandez for I-Homes. Century Furniture has commissioned my larger scale work nationally for their design center showroom vignettes at ADAC in Atlanta, DCOTA in Dania, Florida, and the Marketplace Design Center in Philadelphia. Work is also featured in private collections in Atlanta, Alabama, Florida, Michigan, California, and London. Visit my Facebook page for updates on new artwork and events facebook.com/susanzingerdesigns.